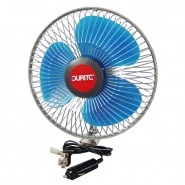 Powerful 12V 6″ in-vehicle oscillating fan, Durite fans supplied with a multi-angle swivel bracket and dual connection kit , CE approved. 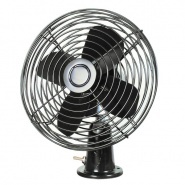 Powerful 24V 6″ oscillating fan, supplied with a multi-angle swivel bracket and dual connection kit, CE approved. Various in-vehicle and in-car fans, including domestic air conditioning fans, workshop and household heaters. Air conditioning and panel heat reducing fans with oscillator function. For cars, trucks, buses, off-road industrial equipment, aeroplane, boats and recreational vehicles. Provides better defrosting in cold weather, better demisting in the spring, summer and autumn and better cooling on hot days. Powerful 12V 8″ oscillating vehicle fan, supplied with a multi-angle swivel bracket and dual connection kit. Powerful 24V 8″ oscillating fan, supplied with a multi-angle swivel bracket and dual connection kit, CE approved. 24V 6″ all metal vehicle fan, two speed, enclosed metal blades on a multi angle bracket with on-off switch on the base, CE approved.